Once upon a time there was a pup. He was actually a Great Dane who really loved treats. His crazy owner named him Scooby Doo. And, every week he and his friends would solve mysteries that no one else really wanted to. That pup even had his own theme song. Scooby Scooby Doo, where are you, we've got some work to do now! Like the song implied Scooby was a great detective. However, that hungry dog did get distracted by Scooby snacks all the time. You can be just like the hero pup in the officially licensed Adult Scooby Doo Latex Mask. The mask is made from rubber latex. 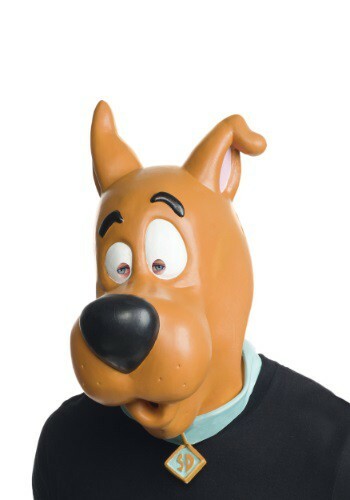 The Scooby face has eyes and mouth slot openings for you to see and talk out of. Get ready to solve some mysteries as Scooby Doo.